Lucio Galletto is the owner of Lucio’s Italian Restaurant in Paddington where he has served sophisticated Italian food for over 25 years. His patrons include artists, whose work lines the walls – a tradition he brought with him to Australia in 1977. His family’s restaurant Ciccio in the fishing village of Bocca di Magra, situated in the Liguria region of Italy, always helped local artists by displaying their work in return for dining, and Galletto has done the same here for Shead, among many others. Galletto is the author of several books including Soffritto: a delicious Ligurian memoir written with David Dale. In 2008, he was awarded a Medal of the Order of Australia (OAM) for his contributions as a restaurateur and author. That year, Lucio’s was included among ? ?The Independent? ?’s top five international restaurants displaying art. In his portrait, Shead sets Galletto against the village of Ameglia, the area in which he grew up. In his arms he is holding an image of The Last Supper. 'He just makes you feel so welcome,’ says Shead. 'He treats everyone like family and makes them feel special.’ The Christ figure is also a reference to DH Lawrence (one of Shead’s inspirations) who spent time in nearby Lerici in 1914. Depictions of Dante and Beatrice in the background refer to the fact that Dante wrote part of his epic poem, The divine comedy , in Ameglia. Levenson studied at the National Art School. Personal assistant to composer Peter Sculthorpe since 1974, her portrait of him was hung in the 2000 Salon des Refuses. Shead also studied at the National Art School. A noted painter, printmaker and former filmmaker, he has had over 50 solo exhibitions and been included in more than 70 group shows. 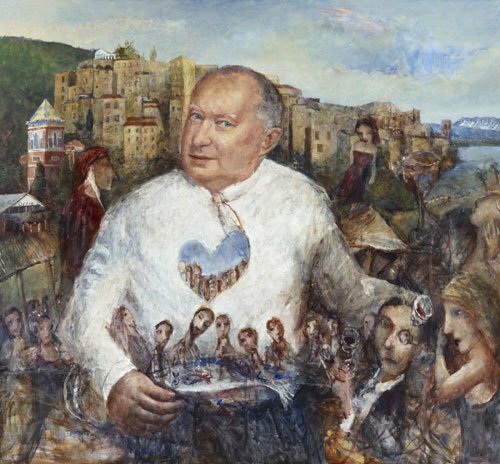 He won the 1993 Archibald Prize with a portrait of publisher Tom Thompson and the 2004 Dobell Drawing Prize. This is his 14th time in the Archibald.